Deaths on Everest Base Camp Trek - How Many People Die Annually? Although not a nice topic to think about, the good news is that deaths on the Everest Base Camp Trek are relatively rare! This is certainly true when compared to summiting or attempting to summit Everest. In comparison to climbing Everest, the Everest Base Camp Trek is extremely safe. The majority of deaths reported on Everest each year are of climbers and Sherpas who have to deal with much greater altitude, more adverse weather conditions and a greater risk of fatal falls than those who are trekking to Everest Base Camp. That being said, the Everest Base Camp Trek still poses a variety of risks because of its location and altitude. Being situated at the base of the tallest mountain in the world means that trekkers can succumb to altitude sickness. Moreover, Everest Base Camp itself is susceptible to avalanches such as the devastating avalanche of 2015 that claimed the lives of 19 climbers. While statistics are readily available for deaths of people climbing Mount Everest, there are no official statistics for deaths that occur during Base Camp treks and related routes. On the low end we estimate that around 3-5 people die each year on the Everest Base Camp Trek. On the high end this number could be as high as 12-15. These numbers are estimates but out of roughly 30,000 people who do the trek yearly, this is a death rate of about 0.03%. Of the few deaths that may occur each year, most of them are as a result of altitude related illnesses or underlying conditions, like heart disease, that have been exacerbated by the high altitude. While you are not actually climbing Everest, you may reach altitudes as high as 5,600m, which is higher than most mountains in the world. Proper acclimatization is essential, but we will speak more of preventative measures later in the article. Because most Everest Base Camp Trek deaths are not reported in the news, it is hard to accurately determine the cause of deaths on the trek. Moreover, there are a number of route variations to Everest Base Camp, like the Three Passes Trek, Jiri Trek and Gokyo Lakes Trek, that all involve a little more risk as they encounter glaciers, rock falls and high passes. These are risks not faced on the classic Everest Base Camp Trek. Almost all trekking deaths in the Everest region are altitude related. Acute Mountain Sickness and similar conditions like High Altitude Cerebral Oedema and Pulmonary Oedema are all caused by ascending too high, too fast. When symptoms of altitude sickness are detected, your guide should advise you to remain where you are or descend to lower altitude. It is imperative that you follow the instructions of the guides as most deaths occur when people try to carry on ascending and only turn back when it’s too late. Altitude sickness can come on incredibly quickly. If you or someone in your group finds themselves incapacitated due to altitude sickness you will need to arrange an immediate helicopter evacuation. The good news is that the Everest region is well-equipped with many helicopter operators. 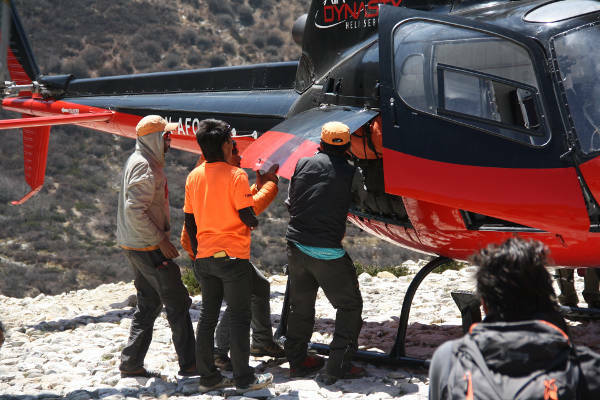 But the cost for a heli-evac is non-trivial (around $2500-$5000) for a helicopter pick up and drop off in Lukla. Underlying conditions can also come to the fore as a result of the altitude. There have been a number of reported cases of people dying from heart conditions during the trek. We recommend consulting your doctor before you embark so that he can inform you of any hereditary or underlying conditions you may have. Before embarking on any trek in the Everest region, make sure you know the difficulty and various risks the trek may pose. Know your abilities and physical limitations by choosing a trek that is tailored to them. Many treks like the Three Passes trek and trekking up various peaks will have different difficulties and risks that come along with them. In general, the Everest Base Camp Trek is very safe and doable for everyone. With a bit of preparation, correct gear and adequate acclimatization the trek should pose very little risk at all. It is very popular so the trails tend to be wide and smooth and support is more readily available. Complacency is never a good trait to have when entering any high altitude region, so we have compiled a list of preventative measures that will ensure a safe and enjoyable trek. Keep an eye out for yaks as they have been known to push people off the trail! 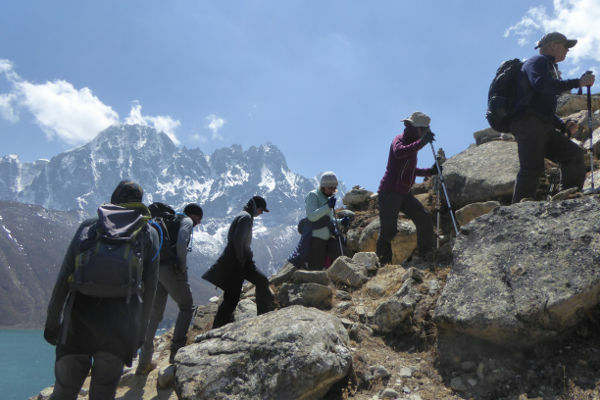 The Everest Base Camp Trek is a well-established, safe trek that poses little risk to the average trekker who follows all the preventative guidelines. A bit of preparation will ensure you have a safe trek through one of the most beautiful regions in the world. I found this article really good. Could you Share your email address, I have a carload of questions to ask. Hi Manish, Thanks for getting in touch. Unfortunately I can’t give out my email but would be happy to try answer any of your questions here. Best regards, Mark! Hi, i recently dis this trek and I can tell you that the number of death is way higher than that. We heard about 3 just in a week!!!!! Hi Yanick, sounds like you were on the trail at a very unfortunate time. Although there are no official records of the number of deaths on the EBC trek I can assure you that 3 deaths in a week is very unusual. The numbers in this article could be slightly on the low side but the thing to remember is that many deaths are due to activities not related to the standard trek to EBC. For example, there are deaths caused by climbing accidents on some of the major trekking peaks like Lobuche / Island Peak ect. Deaths on the major climbing peak, like Lhotse and Everest, and deaths on trails that are more challenging than the standard EBC route, like the Three Passes Trek and Gokyo Lakes Trek. This article only focuses on deaths on the standard EBC route. Well done David! The Gokyo lakes trek is amazing! Hi Anoosha, please leave your question here and we will do our best to answer it. Cheers! I am 14 yrs old and me and my father have booked 14th April to 30th April 18 slot for EBC with a group. Is my age appropriate to climb the Everest best camp? What special precautions do I need to take for my age? Hi Mark, I’m a 55 year old dad and I have a 13 year old son that would like to do the hike to EBC. We’ve done Pikes Peak, Mt. Washington, Katahdin, and hike above the Arctic Circle in the Brooks Range. Wondering about the difficulty of hiking to EBC and if you have any recommendations for a company to connect with for this expedition. Planning on doing a 16 day Everest Base Camp in December with a tour group with no previous trekking experience… is this risky or will I be fine as long as I am aware of the symptoms of altitude sickness? Thanks! Hi Ren, 16 day base camp trek is more than enough time to acclimatise. Make sure you follow best practice acclimatisation tips here: https://ebctrekguide.com/altitude-sickness-everest-base-camp-trek and I’m sure you will have a blast. Hi I have previously climbed only 2 peaks , one is 2500 mts and the other one is 4300 mts . I’m good in stamina . I’m planning to go for EBC and island peak in November 2018 . Would it be possible to climb island peak at that time ? How difficult would it be to climb island peak ? Before island peak , we have kala pattar and EBC . Hi Srinath, thanks for getting in touch. Island Peak is definitely much more of a challenge than EBC and Kala Pattar (which are both just treks). If you have used crampons, a fixed line ascender and descender and are comfortable on a 50-60% slope then you will find Island Peak is a very doable challenge. If however you have no experience with the technical mountaineering then the challenge will be significant. Hope this helps. Thanks Keith. Last time I was in the Khumbu I was fortunate enough to take a helicopter from Dingboche all the way back to Kathmandu. It was amazing! it’s much more dangerous than you would normally expect, and I believe saying that anyone can do it is not correct – there are a lot of conditions that you might not know about before you go there that will prevent you from getting to the base camp, not to mention that the trek itself is extremely difficult (mostly due to the altitude). p.s. we were doing Gokyo lakes trek, so it’s a bit harder than the classical EBC, but I believe it still applies. How many people have died at camp three and I’m also wondering what the population is up to there. Hi Dakota, Camp 3 is on Mount Everest. It is not part of the trek. Only people climbing Everest go to Camp 1, 2, 3, 4 and the summit. I am 71 years old.Climbed ABC 1 year ago. Love to go back and climb EBC. Since EBC is higher what are the risks. Hi Robert, If you managed ABC, I think you will be fine on EBC too. Admittedly EBC is longer and higher, but the approach is gradual and if you plan in some acclimatisation days, you can reduce the risk off AMS considerably. In terms of insurance, most providers don’t cover over 70s. I know the one we recommend, World Nomads, doesn’t. If you based in the UK I recommend contacting the BMC, or if in the US try the American Alpine Society, they may be able to help.